As an extension agent, I often get asked the question, “When is the best time to prune (insert name of plant here)?” You can insert the name of anything from abelia to zelkova and almost every plant name between the two. One of the best resources I have found to answer that question is a website from Virginia Tech. Their website (http://pubs.ext.vt.edu/category/trees-shrubs-groundcovers.html) has three different pruning calendars, one for deciduous trees, another for evergreen trees, and the third for shrubs of all kinds. Our climate is similar enough to Virginia that following this guide will yield great results. Here are a few hints on when to prune. If the plant flowers on old wood (late winter through spring), it will most likely need to be pruned right after it finishes flowering. If the plant blooms on new growth (late spring through summer), it should be pruned while it is dormant. When in doubt, call your local extension office. 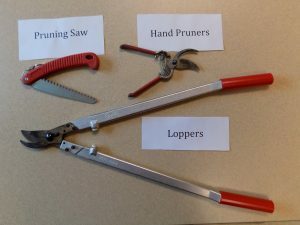 Most offices have Extension Master Gardener Volunteers who have access to these pruning calendars and can help you find the correct time to prune your particular tree or shrub. As we are now in the winter season, this is the perfect time to prune summer flowering plants such as abelia, beautyberry (Callicarpa americana), boxwood (Buxus spp. ), Rose-of-Sharon or althea (Hibiscus syriacus), crepe myrtle (Lagerstroemia spp. ), river birch (Betula nigra), fruit trees, and most deciduous trees. This is a short list of the more common plants that should be pruned while they are dormant. 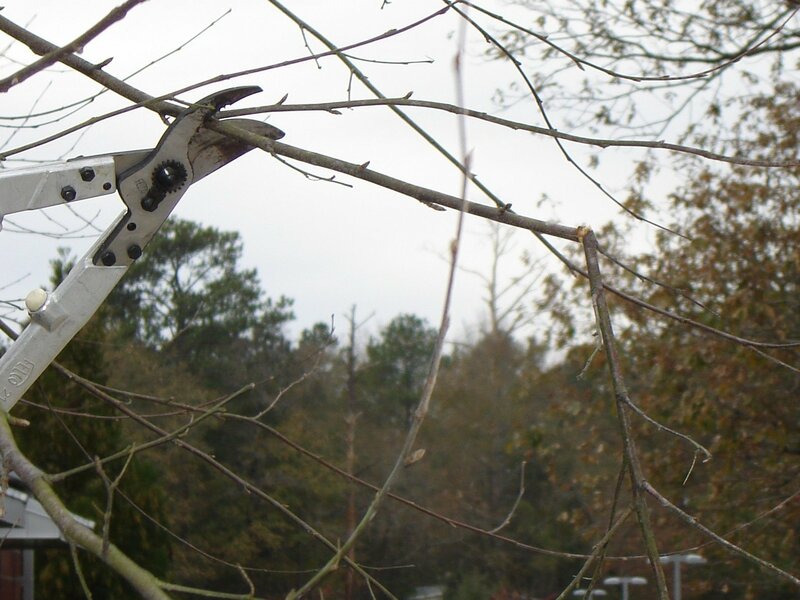 There are three basic types of pruning that are done to ornamental trees and shrubs. 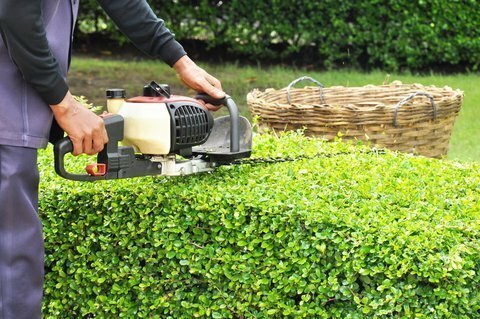 Use a hedge trimmer to shear away any unwanted foliage to make balls, boxes, and geometric shapes in the landscape. This kind of pruning leads to a dense layer of leaves on the exterior of the plant canopy with little or no foliage in the center of the plant. The result is a very formal look in the landscape. This pruning technique is most often used when a plant is starting to grow out of bounds—into a sidewalk, roadway, or lawn—or is broken and only the offending part of the branch needs to be removed. When heading back, you remove the main branch back to a side branch that is at least half the diameter of the main branch. The energy will then go into the side branch and not into new bud growth. A 45-degree angled cut is made about one-quarter inch to one-half inch away from the side branch. This one is fairly obvious. The entire branch is removed from the plant. When making this type of pruning cut, a little knowledge of the anatomy of a tree is important to have. 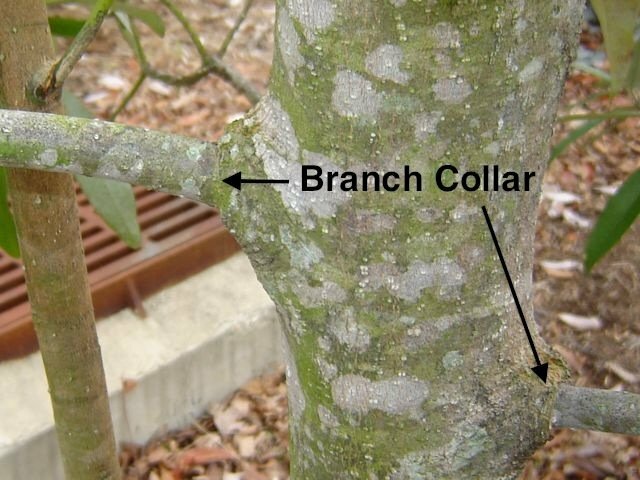 Where a branch grows out from a tree there is a branch collar. The branch collar is where the meristematic (actively growing) tissue is located. 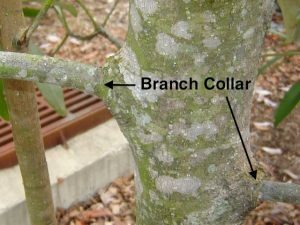 In order for the wound caused by pruning to heal quickly and properly, the branch should be removed just outside the branch collar. Whichever type of cut you are making, be sure to use the correct tool for the job. For branches smaller than three-quarters of an inch, use hand pruners. 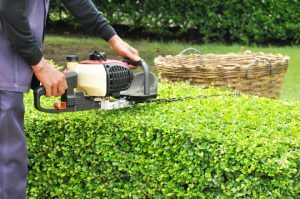 For branches up to one and three-quarters of an inch, use loppers or lopping shears. For branches larger than one and three-quarters of an inch, use a pruning saw or a chain saw. When selecting hand pruners and loppers, there are two types from which to choose. The first is the anvil type where a sharp blade meets a flat anvil. This type often crushes the bark and wood on one side of the cut causing the branch to heal slowly. The second is the bypass type that works like a pair of scissors with one blade passing by the other blade, making a cleaner cut that heals quickly. 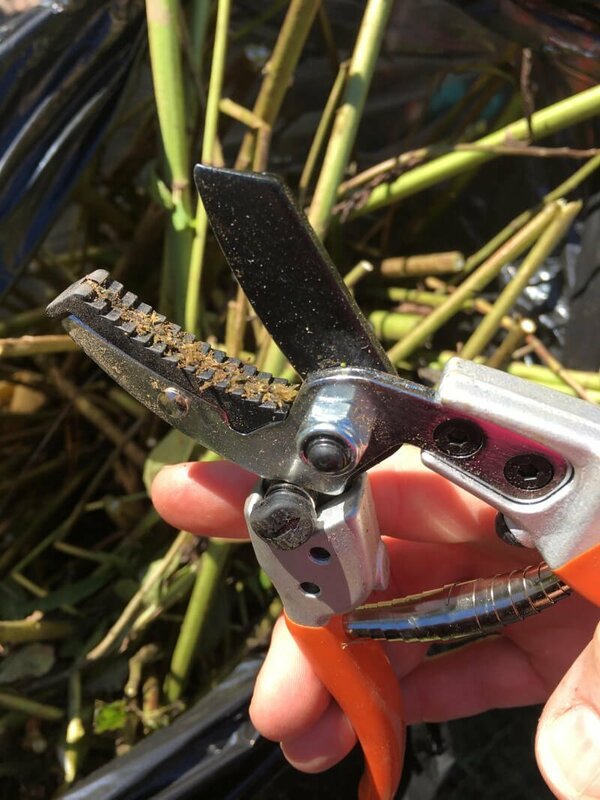 Bypass pruners are recommended in most cases. 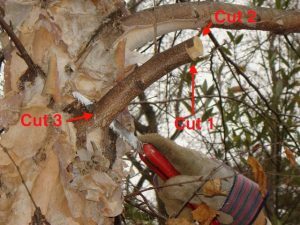 When using a saw to remove a larger branch, the three-step method of removal is recommended to guard against the limb breaking off and tearing the bark down the trunk of the tree. Step one of the three-step method begins with a cut to the underside of the branch about 12 inches from the branch collar. Cut about one-third of the way through the branch. The second cut (step two) should start from the top of the branch about two to four inches further out from the trunk than the first cut. 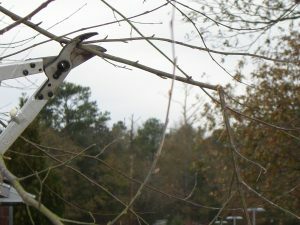 As this cut progresses, the weight of the branch will cause the branch to crack back to the first cut and fall to the ground. 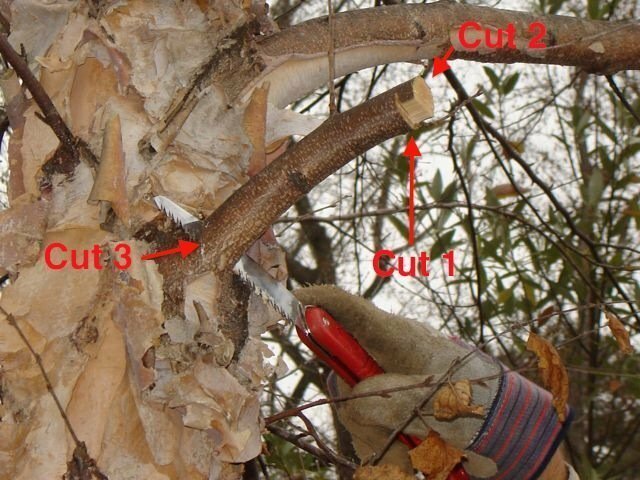 The third cut (step three) is to remove the remainder of the branch and should be made just outside the branch collar, leaving a clean circular scar near the trunk. Remember that pruning tools can be dangerous and one should always wear proper protective equipment. Gloves are needed with all types of pruning tools. Safety goggles protect the eyes from falling branches, side branches, and sawdust. When removing branches from above your head, a hard hat is an excellent idea. Shawn Banks is Horticulture Agent with NC Cooperative Extension.